Warm wishes for a wonderful and especially, for a pearly New Year! Following our tradition, the Passage reopens with a pearl post. Because I've recently received inquiries about what to do with 'not quite you' pearls, I've dressed the windows in reno ideas. By far my most frequent inquiry concerns Mom's or your own necklace of 5mm-6mm akoyas, the classic wedding strand, now too short and small. Why not restyle, provided Mom won't pitch a fit? Not all the pearls may be salvageable; body oil, cosmetics and especially perfume may have degraded the pearl's surface. Left: Pick the best five or six pearls and combine them with beads; this example from Jan Logan shows white freshwaters combined with lagoon-blue Amazonite rounds and ovals, a graceful way to incorporate sentimental pearls into a new piece. (Amazonite is very reasonably priced; this piece is $AU 585). Centre: Combine the pearls with new freshwaters and the more contemporary wire-wrapping. Example: Kojima Company's "Winter Blossom" necklace, which combines not only sizes but varieties and colours. This style is also a good solution if the pearls were originally a graduated strand. Right: Here's an idea for the woman who finds a necklace too heavy, or prefers a casual piece. 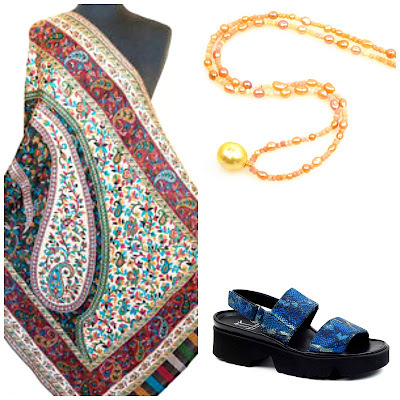 The example is Mallory Marks pearl collage necklace: sapphire beads—some tumbled, one faceted—with one Tahitian 11mm pearl (but you could use any pearl variety), and several small pearls; 18k chain. Another reader wrote, "I have my mother-in-law's torsade of seed pearls, bought on a 1981 cruise. They are not 'me' at all... but it seems a shame to discard them." You can still find such pieces still sold by mainstream jewellers, and they do carry a retro whiff. But tiny, lustrous seed pearls have a distinct charm, and if good quality, can live again in a hipper new design. Left, the original cruise souvenir; right, the seed pearls treated as 'chain', with baroque Tahitians added. The piece shown showcases 8.5 mm Tahitians, from West Main Pearls. Perhaps the most mournful e-mail: "My husband bought me beautiful pearls for my birthday, but did not think about the colour. Now I have these yellow South Seas, not great with my skin tone. They just seem to wash me out." Assuming these are natural coloured gold South Seas, that's a costly misstep. Though you can't dye pearls like a pair of shoes, you can tweak their effect through artful composition, by breaking up that swath of gold with other coloured materials. 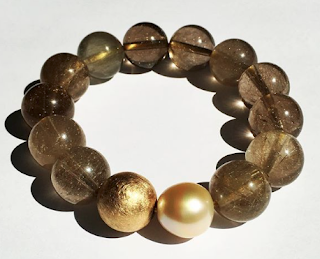 Two takes on restyling gold pearls: left, some of the golds mixed with Tahitian baroque and keshis, example from WestMain Pearls. Grey leavens the 'goldiness' and varied shapes make the necklace less formal. Right, a multistrand necklace of brown and white crystals, white pearls, gold (dyed) pearls, and gold seed beads by NewJulianasCreations.The cost for adding crystal strands would be modest, and I would get top grade glowy freshwater whites for the contrast colour. Where to get more pearls? You can consult a good jeweller, or look yourself among these or similar web-based vendors. Below, examples of the company's goods that I might use in the renos above. Pearl dealer Carolyn Ehret sells on eBay, but the cautions of buying on eBay do not pertain to her store, which specializes in high-quality pearls and gemstones. When mixing the classic akoyas into a wire-wrap, five circled Tahitians that flash multi-colours would be one of the varieties to add; the lot shown is about $US 35. Also great for findings such as gold spacers. Kojima carry a selection of unusual pearls from singles to lots of five or so, and you can contact them for larger lots, or a mix. For those gold South Seas, I'd use these dyed grey keshi (just over $100)... and maybe scatter in a few rondelle beads for fun. This eBay seller, from whom I have not bought pearls, but where I routinely look, has 100% positive feedback. You can also find gemstone beads, like these tanzanite rondelles, which would look terrific in that akoya "collage" restyle. 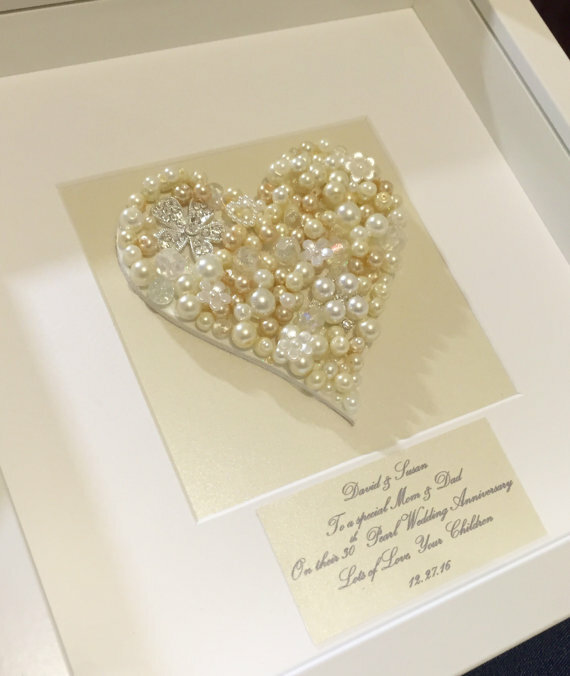 If your pearls are sentimental, but you would never wear them, consider framing! This example is from LoveLightSparkles on Etsy, but you could play with your own design. Visit a craft store to buy a shadowbox, mount the necklace with pushpins, perhaps against a backdrop of an old photo or striking patterned paper, and you'll have a gracious memento. Happy New Year and I hope its a pearly one too! 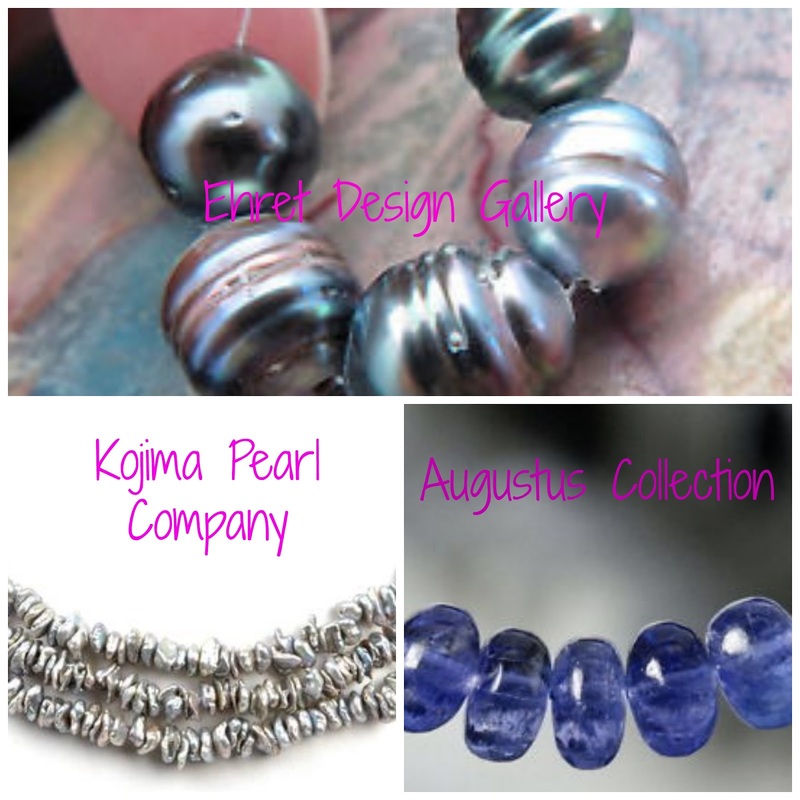 Your ideas on redesign are a great way to make a vintage simple strand into something much more current and wearable. I have been lusting after a pair of simple grey baroque south sea earrings for quite some time and have not yet found the "perfect pair." They must be out there somewhere...sigh. 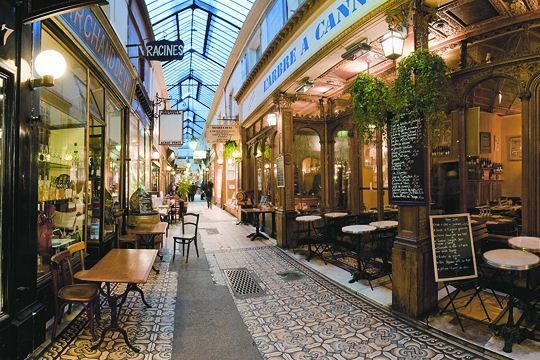 hostess: Any of the three vendors above could accommodate your request. All their stock is not online, and I have known one, Kojima, to take about a year to find something I wanted, and it was perfect. Price will depend on whether your greys are freshwater or saltwater variety, and dyed or natural colour, but grey baroques are not hard to find. As always, your pearl redesign posts are so much fun...lots of wonderful ideas. I was especially drawn to the Winter Blossom necklace and will definitely pin it for future reference. Thanks for making this so easy to do. Maybe this will be the year I tackle my too young, too small strand. Great to see the Passage is reopen, I look forward to it. Welcome back! I was concerned when I didn't see a post on Tuesday. (My elderly mother distracted me with a trip to the emergency room, so thoughtful :). Such creative ideas for renos, with dramatic changes in appearance! I thoroughly enjoyed this post. Happy New Year and glad you are back. This is a wonderful tutorial. I have been looking at the Kojima Winter Blossom necklace for almost a year. I wish someone would buy it and put me out of my misery. I'm committed to not buying new clothes, shoes or jewelry this year, but I taught myself to knot beads and pearls recently. I plan to redesign some necklaces given to me by my 80 yo mother-in-law and I will use this post as a guide. Your posts are always inspiring and I appreciate the Etsy and eBay references. Thank you. Wonderful selections. I've always liked the combination of pearls and Amazonite, although I've never procured such a piece. I never thought about asking Kojima for a piece I was dreaming of or wanting. Good thought. LauraH: Yes, this is the year! Happy New Year. Wendy: Nothing to be concerned about here, and I hope your mother is OK now. Leslie Milligan: Oh that makes two of us, and it does not help to know that they could still make another one if this one sells. Yes I am bad! I would love to see your redesigns and anyone else's. Mardel: The owner of Kojima (Sarah Canizzaro) describes herself as a "pearl hunter" and can find just about anything you can dream up, pearl wise. Yes, you are, but that is part of your charm. Ha!